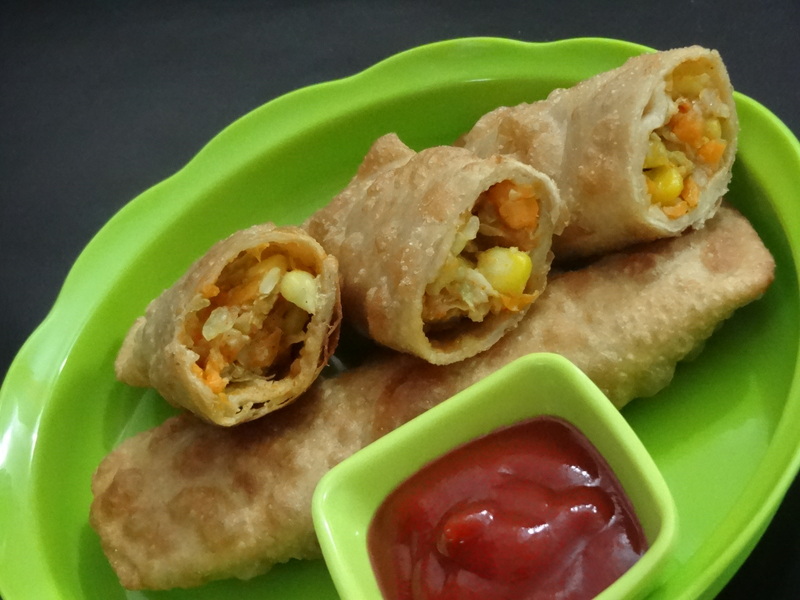 Vegetable Corn Spring Roll the best snack for all those who don’t consume vegetables as it is or when used in a curry. Kids like my son, who don’t like to eat vegetables can be fed with this snack to ensure the get their share of energy and vitamin intake. The preparation is simple and it goes like this..
• Mix wheat flour, maida, cooking soda, curd, salt and a tsp of oil. Knead it well adding sufficient water to get smooth dough. • Keep it aside till your stuffing is ready. • Dice potatoes, carrots, beans into equal sized cubes. Add sweet corn kernels to them and cook in pressure cooker adding little water. • Wait for 2 whistles. Turn off the stove and allow it to cool. • Heat 2-3 tsp of oil in a cooking pan. Add finely chopped cabbage and cook till the raw smell vanishes. • Now add cooked veggies to this. Keep stirring for 4-5 minutes. • Add salt, green chilly paste, coriander powder, aamchur and jeera powder. Can substitute Dry mango powder/aamchur with lemon juice. • Cook for a minute or two. Allow the mixture to cool. • Heat oil in a deep dish for frying the spring rolls, while you prepare the rolls. • Take the rested dough and pinch a lemon sized atta out of it. • Press into round rotis of the desired size. Place the stuffing on the roti. Roll it from one side. • When you reach the other end, pinch the atta to seal it, so that you don’t spill the stuffing. • Seal the top and bottom edges too. Place them in hot oil carefully. • Cook on both sides till light brown. Cut them and serve with tomato or chilly sauce.